Hello, Hallmarkies! 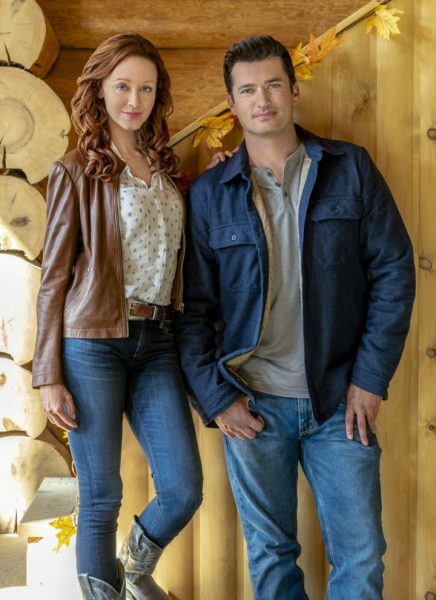 It’s time again for the latest Hallmark Channel Fall Harvest movie called Under The Autumn Moon starring Lindy Booth and Wes Brown to air Saturday, October 13 at 9pm/8c. The movie begins when an ambitious executive (Lindy Booth) convinces her boss that a place called Harmony Ranch would be perfect for their company retreats. He agrees to let her check it out, but her plan hits a snag when the owner, a charming cowboy (Wes Brown), refuses to sell unless she can promise to preserve its history. He convinces her to stay and experience the magic of the ranch, but when her boss shows up with other plans in mind, will she have to make a choice between love or ambition? Tune in to find out! When deciding on a recipe to make for this movie, I knew it had to be hearty and filling for a ranch setting. 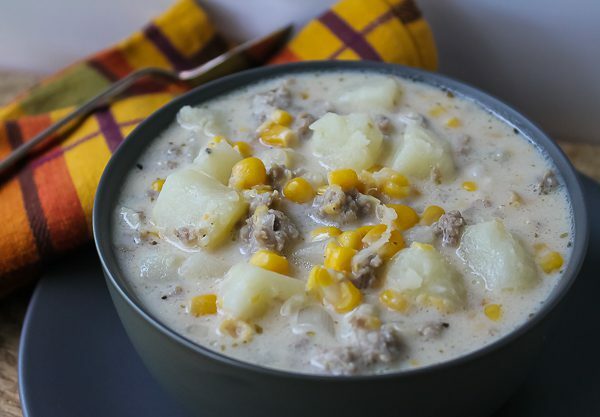 One of my favorite fall recipes is for “Hearty Corn and Sausage Chowder” which sounds like a great meal to have on a dude ranch. It’s been a favorite in our family for many years and so easy to make. Serve it along with some hot biscuits and imagine enjoying it at a ranch setting with a handsome cowboy. Now do you want to watch the movie? Of course you do! In a large soup pan over medium-high heat brown the sausage, breaking up into pieces. Add the onion and stir until onion softens. To the pot, add potatoes, salt, marjoram, pepper, and water. Bring to a boil, reduce heat to low, and let simmer until potatoes are just cooked through, about 15-20 minutes. Add both corns and milk. Heat until hot and serve. They certainly find adorable looking young people for the Hallmark movies. And your chowder looks perfect for this fall weather. Pull up a chair, grab a mug of chowder and find the remote. It’s Hallmark movie time in the fall. Delightful!